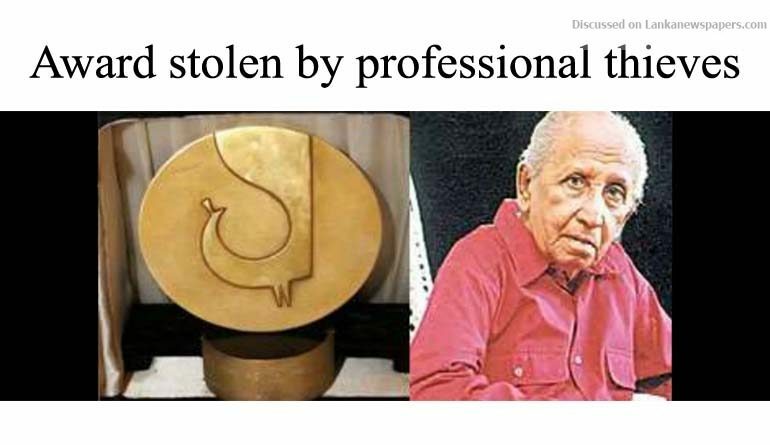 Five persons arrested in connection with the theft of the Golden Peacock Award belonging to late veteran Sri Lankan film maker Dr. Lester James Peries were professional thieves, the Police said yesterday. In addition to the Golden Peacock Award, the Police had found a very expensive phone which was stolen by the same group of suspects from the late film makers house and arrested a sixth suspect who had bought the phone. They were later remanded until May 21 after being produced in Courts. Police Media Spokesman SP Ruwan Gunasekera told the media yesterday that the group had been stealing valuable items from places where large crowds were present, like funerals. They had been targeting such gatherings especially held at residences of affluent people. The Police had also arrested the person who had purchased the stolen mobile phone from the suspects, a resident of Nawalapitiya. The Police said the camera footage taken on the funeral day by both journalists and others had helped them to identify the suspects. The suspects had been apprehended during a raid conducted by a special police team in the Kaduwela, Mathugama and Nawalapitiya areas. The Police said the gang had used a three wheeler to get away after stealing the award. The suspects were identified as residents of Kandy, Kaduwela, Nawalapitiya, Gampola, Hiniduma. The Golden Peacock Award was thought to have gone missing last Wednesday (May 2) at the time religious obsevances were been performed prior to the remains of Dr.Lester James Peries were taken to the Independence Square for the last rights. The suspects under interrogation had told Police that they feared due to the extensive publicity given by all media organisations related to the theft of the Golden Peacock Award. Therefore, the suspects had said they had abandoned the idea of selling it as it would be easily identified and later decided to abandon the award by placing it on the head rack of a private bus which plies the Kaduwela to Kollupitiya.